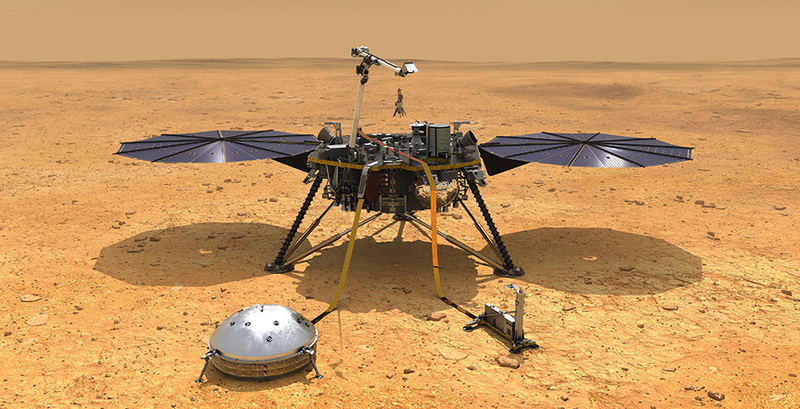 Artist's Concept of the NASA InSight Lander on the Martian Surface. Science is a long and occasionally embarrassing process. Take for example the exploration of Mars. From the natural philosophers of ancient times to the InSight Mars Lander heading to Mars today, we always have some idea of what we’ll find on Mars. But we have been so very, very, gloriously wrong! Over and over again. It’s how we learn. In 1877, astronomer Giovanni Schiaparelli described lines he saw on Mars as canali, this is sometimes translated as canals. Could it be, people wondered, that these canals were evidence of Martian civilization? Flammarion wrote about Martians who “would have seemed frightful” if they weren’t so graceful with their six limbs and wings. His illustrators went another direction. Camille Flammarion, an astronomer and author, wrote Urania: A Romance. In Urania, an astronomer returns to Earth after his death to tell a friend that he, the astronomer, has been reborn on Mars as a beautiful, six-limbed, “winged, sentient, living flower” woman. This Martian woman spills the beans about Mars. She tells us Mars has a great climate, an advanced society, and a network of canals. Percival Lowell, businessman and author read Flammarion’s books. Inspired, he decided to find Martians. Since he was rich, Lowell built an observatory and wrote popular books like Mars As An Abode Of Life and, Mars and Its Canals. Lowell believed that although Martians evolved in harsh conditions, they needed water. So, he reasoned, they built canals. According to Lowell, Martians built canals to move water from Mars’ ice caps to its deserts. During spring, ice from the poles would melt, flood the desert, and Mars would bloom. Martian canals allowed them to survive. But, Lowell warned, time was running out. Soon engineering wouldn’t be able to meet their water needs and Martian civilization would die. Lowell argued that we had to find a way to communicate with them before it was too late. In 1909, David Todd, professor of astronomy and higher mathematics at Smith College, planned to launch himself 50,000 feet up, in a hot air balloon, and signal Mars with a big mirror. Todd never did this. But he announced it frequently. In 1921 the New York Times described Marconi, “father of radio” as being sure that “Mars flashes messages.” Secretary of the Navy Curtis Wilbur asked radio stations to stay silent while operators “report any electrical phenomenon of unusual character” for 4 days in 1924 because there were “astronomers who believe...that Mars may attempt communication by radio waves with this planet.” They didn’t hear anything from Mars. Professor David Todd: a man with a great plan, a balloon, and a mirror. In 1937, at his birthday party, Nikola Tesla announced he had a way to “transmit ...energy from one planet to another, opening the way for interplanetary communication.” But at the same party, Tesla also talked about a “death beam,” his “universal peace discovery,” and immortality. Maybe it was just that kind of party. In 1957 the Lowell Observatory reported “strong evidence” of life on Mars, but said it was “More likely to be moss than man.” The National Bureau of Standards didn’t think there was enough water vapor or air for people on Mars. The Rand Corporation argued in the Space Handbook, that even without air or liquid water there was “good evidence that some form of indigenous life forms exist [on Mars]." Mariner 4 shows us images of Mars without canals. In 1960 the USSR started sending probes to Mars. It turns out this is hard. Both the U.S. and the USSR lost several probes. Then, in 1964, Mariner 4 performed the first successful flyby of Mars. Mariner 4 captured 22 tiny photos of Mars but found no sign of vegetation. In 1971 the Soviets launched Mars 2 and 3, both of which reached Mars. But, it was during a dust storm. Mars 2 vanished in the storm. Mars 3's lander was destroyed shortly after landing. In 1976, NASA successfully placed Viking Landers on Mars. Scientists, including Carl Sagan, hoped to find evidence of life on Mars. Instead, they found “unexpected and enigmatic chemical activity in the Martian soil,” but no life, no plants, and no canals. Viking shows the same lack of canals, people, or plants. But it shows us this desolation in color! In 1997 Pathfinder landed on Mars. Pathfinder returned more than 16,500 images from the lander. The Mars Global Surveyor began mapping Mars in 1999. In 2016 the United States Geological Survey published a geological map of Mars, based on data acquired since the Viking mission. They hadn’t found canals. They hadn’t found life. But, exploration continues. The United States Geological Survey is working on geological maps of Mars. On November 26, 2018, NASA’s InSight Lander is set to land on Mars and begin studying the interior of Mars. You can watch it happen live, via streaming, at the Mark Taper Auditorium in Central Library, as well as other library branches. Who knows what we’ll learn we were wrong about next?